Capsule Summary: While returning from an aid station, Hawkeye gets in an accident and sustains a concussion. To stay awake, he talks to a Korean family until help arrives from the 4077th. I’m not sure I’d call “Hawkeye” a controversial episode. A polarizing one, perhaps. There are five reviews at the Internet Movie Database. Four are positive (three 9-star reviews and a single 8-star review) while one is negative (a 1-star review). Of the eight reviews at TV.com, five are positive (all 10/10) and three are negative (1.5/10, 1.7/10, and 2.5/10). Those who despise the episode like to call it an ego trip on the part of Alan Alda. But he didn’t write the episode or come up with the idea for it. I’d like to think even those M*A*S*H fans who don’t like “Hawkeye” can admit it’s an interesting writing experiment from Larry Gelbart and Simon Munter and features an impressive performance from Alda. Personally, while I truly appreciate the experiment and the performance, I don’t think “Hawkeye” has much rewatchability. It’s an episode you watch once and don’t revisit for a decade or so. In terms of story, there’s really not much to discuss. Hawkeye basically rambles for 20+ minutes. He discusses medical school, watching musicals in Boston, growing up in Maine, the wonder and mystery of babies, and the complex human thumb. Not surprisingly, Hawkeye talks about women a lot: Lefty the waitress from Sol and Sol’s Delicatessen; Eloise McKay from the eighth grade; and strippers Ann Corio, Margie Hart, and Polly O’Day. Two were real-life burlesque dancers. Polly O’Day and her parrot were made up for the episode. If I had to pick a favorite part of the episode, I’d probably go with Hawkeye’s ode to the human thumb. 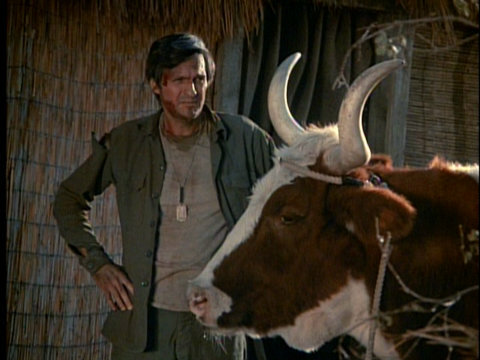 Hawkeye talks about movies with Margo the cow. The reason for doing it was because it represented a terrific writing and acting challenge – and by Season 4, the challenges were getting tougher and tougher. >Were you pleased with the results? Yes, I was. And Alda was very helpful in terms of the script, as well. > I know you and Simon Muntner wrote this ep but I always wondered how much, if any, input Alda had here. >It’s a half hour Hawkeye fest. I don’t know of any other episode that features only one major character throughout. Had to be Alda’s idea. Turth [sic] is, it was not his idea at all. But he contributed several bits and ideas to the script. That’s what I meant when he some input in the show. > LG, what were you thinking with this one? Was it an experiment gone wrong? Only for those who think that’s so. While there’s many an episode in the first four seasons that I think were complete or partial misses, l can’t say I feel that way about this one. It’s not a question anyone being right or wrong here, it’s all a matter of personal taste – or distaste if that’s the case. I’ll stop, before this becomes a one-man show, as well. With two exceptions, the actors and actresses playing the Korean family in this episode made other appearances on M*A*S*H. Philip Ahn (The Father) was later in “Exorcism” during Season 5 and “Change Day” during Season 6. Shizuko Hoshi (The Mother) originated the role of Rosie in “Mad Dogs and Servicemen” during Season 3. She was later in “B.J. Papa San” during Season 7 and “Private Finance” during Season 8. June Kim (The Pregnant Woman) guest starred in “The Abduction of Margaret Houlihan” and “Souvenirs” during Season 5 and “Goodbye, Farewell and Amen” during Season 11. Susan Sakimoto (The Oldest Child) also guest starred in “The Abduction of Margaret Houlihan” during Season 5. Jeff Osaka and Jayleen Sun (The Younger Children) have no other acting credits according to the Internet Movie Database but Sun later worked as stunt woman on several films between 1988 and 1995. Hawkeye is the only main character to appear in this episode. I just feel like if this was an experiment on Larry Gelbart’s part to see if a single character could carry the whole show for an episode that another character should have been chosen: Hawkeye was already sort of the unofficial main character, so having an entire episode of him monologuing was pretty pointless and redundant. Any of the other characters could have gotten a chance to shine in the spotlight, and we probably could have learned some things we didn’t already know about said character. COMBAT! 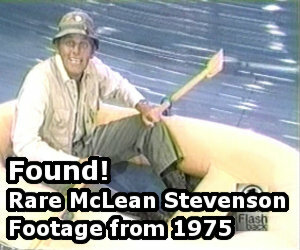 did an interesting episode where it’s two main leads – Vic Morrow and Rick Jason – didn’t appear at all, and it was just the supporting castmembers carrying the show: that’s the kind of episode M*A*S*H probably could have done: without the Swamprats or Potter, and maybe focus on some sort of hijinks that Radar and Klinger get into. Yes, BDOR, that’s right! I never liked the episode and always thought of this: What if, instead of Hawkeye, who was always given the spotlight anyway, it was Mulcahy who had gotten a bump on the head, and it had been William Christopher who had to have a twenty-five minute monologue instead of Alan Alda? We could hear more of his ideas on religion, what he thought of the others in camp, and his mysterious home life with his sister, the sister. Anyone like that twist on this, as RJ put it, “Polarizing” episode? Always love feedback! Honestly any character would have been better than Hawkeye since we already get so much of him. What a perfect opportunity to let another character shine and to learn more about them. They could have done an episode like this once per season or so to give each character a chance. BJ we could learn more about his wife and how they met, their life in SF, etc. Potter could tell endless stories about previous wars or his family at home. Radar could tell us tons of stories about Iowa, his family, the farm, etc. Burns we could get more insight into his troubled childhood and upbringing, learning how he became how he is. Charles could tell us basically the same thing as Frank except the opposite, his privileged and strict upbringing. Margaret we could learn more about her military history or upbringing with her parents. Mulcahy you already said what we could learn from him. Klinger we could learn more about Toledo. and on and on. Would have been great. Something I found out just recently about 2 of the M*A*S*H alums while watching the 1967 Academy Awards – Shizuko Hoshi was married to Mako (who was nominated as Best Supporting Actor for The Sand Pebbles). In my opinion, this episode is just OK, but not much better. I haven’t watched it in a while, so I will watch it soon and I may update my post. I agree with futurenurse, it’s an interesting concept, but I don’t think it works. To me, what made M*A*S*H work was the ensemble of characters. (This is kinda why I like the later seasons better). and the single character just doesn’t carry the episode for me. I have always liked this episode, it has many memorable quotes and it just process what a tour-de-force Alan Alda was for the show but also in general. Technically, he sings, acts and dances across this twenty-five minutes (for varying lengths of time admittedly). I’m pleased to see confirmation that it was not Alda’s idea, as those who like to bash him would no doubt leap on this episode for ammunition, and I never really thought he would effectively give himself a single-hander. I remember reading somewhere back when this one first aired that they got the idea for it from an episode of “MAUDE” where the entire show consisted of Maude by herself in a physiatrists office talking non-stop. Also interesting that Hawkeye mentions the film The Ox-Bow Incident (which is great) which stars a young Harry Morgan. I like this episode. Not so much for Alda’s performance. I just appreciate the Korean family. Their hospitality. And the patience they exhibit in putting up with Hawkeye’s irritating personality. And yes. I know he was trying to stay awake. Watching this episode for the Xth time I noticed for the first time the cow behind Hawk and the Mother while Hawk was talking about the girl letting him touch her slip. Takes a little bit of wind out of the “Where did you get meat/wait, where’s the dog?” ending joke. Has no one else noticed the time discrepancy? Hawkeye tells the girl the 4077 is 20 miles away but gets upset when Radar doesn’t come back with her quickly. Unless she can get a ride, it’s going to take at least a day to get there. She would probably have trouble locating it too.